Why The Heart for your child’s summer camp? We know that choosing a summer “home” away from home for your child’s summer camp experience is an important task. Finding the perfect one with the right session length, activity offerings, tradition, history and location can be complicated, but well worth it. Families have told us for years that campers come home more confident, focused, and helpful. Studies now confirm what we have known all along. Camp is one of the best investments you can make in your child’s future. So why The Heart? The Heart combines a traditional camping program, engaging and knowledgeable counselors in unique and outstanding facilities. Limited camper enrollment enables everyone to be on a first-name basis, increasing the sense of a warm, caring family atmosphere. WHEN PEOPLE THINK OF CAMP, THEY THINK OF GIRLS DOING ARCHERY, CANOEING, AND HORSEBACK RIDING. THOSE WHO HAVE EXPERIENCED IT UNDERSTAND THAT IT IS SO MUCH MORE. The average American youth spends 6 to 8 hours a day in front of a screen. By leaving electronics unplugged, girls tend to be more active. We eat healthy meals, snack little, walk a lot, run, laugh and play. Let’s hear it from a camper! is the best for soaking it all up! 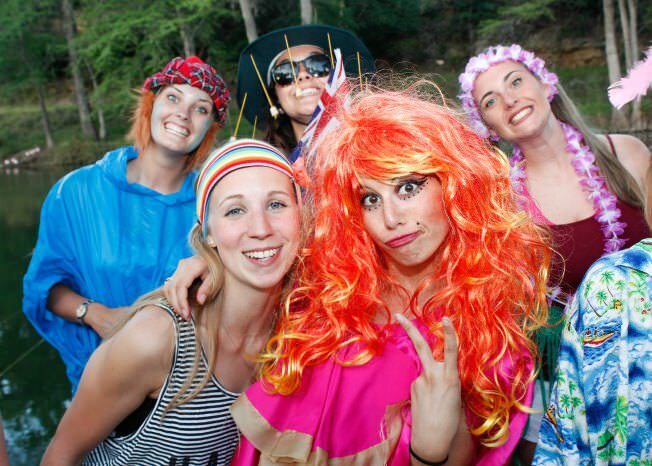 Not movie stars or sports figures, but real live camp counselors to look up to and emulate! 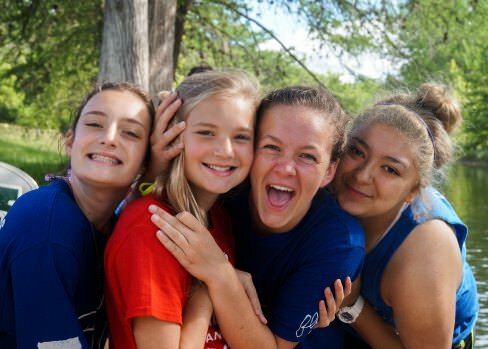 Camp provides a support system that loves, encourages, and guides your camper to strive to be the best she can be. When technology is not in the picture, campers improve their ability to relate to others face-to-face. By making eye contact and learning to observe small gestures, campers develop social skills. Experiencing new things together forms friendships that grow and thrive. Having the opportunity to try new things in a safe and encouraging atmosphere is exhilarating. At camp, success is encouraged and resilience after failure is supported. 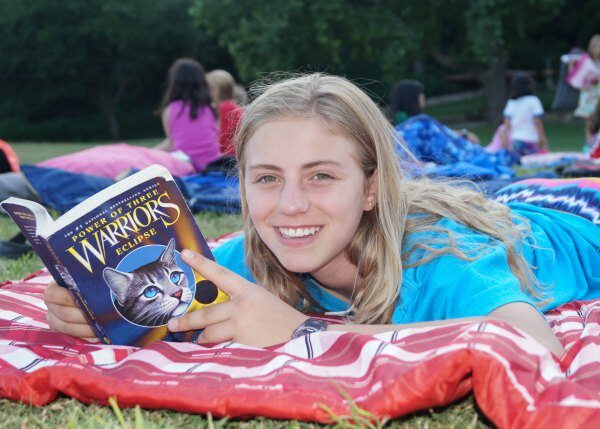 In doing so, campers develop a sense of self-confidence for facing adversity in life. Campers are in a new place away from parents for the first time. By being “alone”, campers become responsible for their own health and happiness. From simple things like brushing their teeth daily, to recovering from an argument with the roommate, self-reliance at camp prepares them for self-reliance in college and beyond. 7 Aspects that make The Heart great! Thanks to Katniss, archery’s popularity is back, but finding an archery range at home to practice your newly acquired hobby may be a little difficult. Heart O’ the Hills has a full archery range, bows of every size and level, and instructors that are trained through USA Archery’s SafeSport. 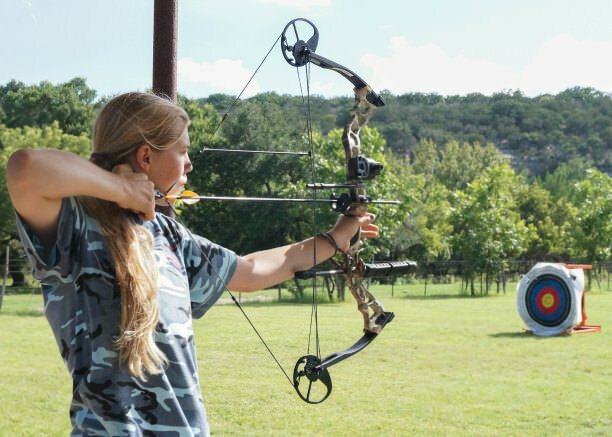 During the term, campers are encouraged to work toward earning medals and pins of the Camp Archery Association. Though some of our counselors may not have been campers themselves, they quickly learn the love of The Heart. Campers and counselors alike are comfortable being themselves at all times and experiencing touchstone moments filled with enthusiasm. Silliness to sing at the top of their lungs, courage to audition for a leadership position, and cheering loudly for their tribes all happen with the utmost enthusiasm. Once a Heart girl, always a Heart girl. Over the past 60+ years, Heart girl friendships have blossomed. The late nights, early mornings, outdoor playing and competing all reinforce friendships that will last forever. These are the kinds of friendships that are like the stickers in your socks. You know they’re always there and you just can’t shake them. At Heart O’ the Hills, the sounds of nature abound. Only the noise of occasional passing cars disrupts the chirping of crickets, hooting of owls, and whispers of wind through the cypress trees. Field Sports happen in the big field, horseback rides trails among the hills, and swimming in the Guadalupe River every day. Late night tepee bonding is spent peering through the arms of the Milky Way for shooting stars. Read a book, contemplate cloud shapes, star gaze at camp, campers are not in front of a screen. 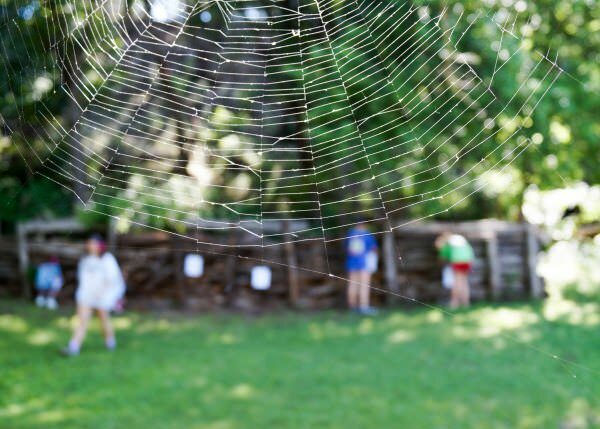 Campers engage in conversation, learn social cues, and manage sharing personal space within a tepee, without the escape of looking down at their phone. Campers become familiarized with technology-free life and take on new adventures. If pictures speak a thousand words, this one speaks many more. 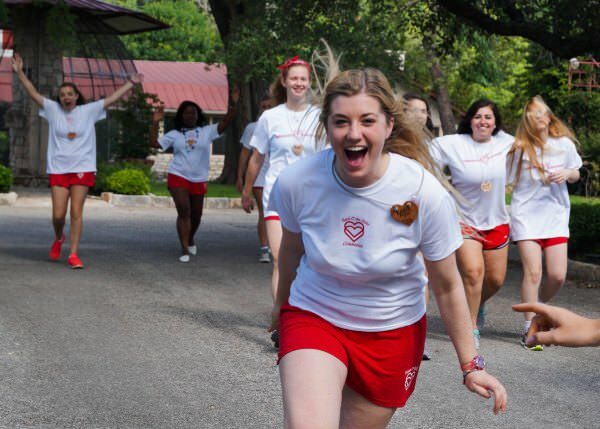 The excitement shown on Opening Day for a first-time counselor only sets the level of passion throughout the term. Our staff is well-rounded, compassionate, skilled, intelligent young women who each bring their own touch to Heart O’ the Hills. Some are former campers, some come from around the globe. Together they mesh to fabricate a place for girls to call home. Jane often says the greatest of cathedrals cannot compare to the beauty of God’s work along the Guadalupe River. 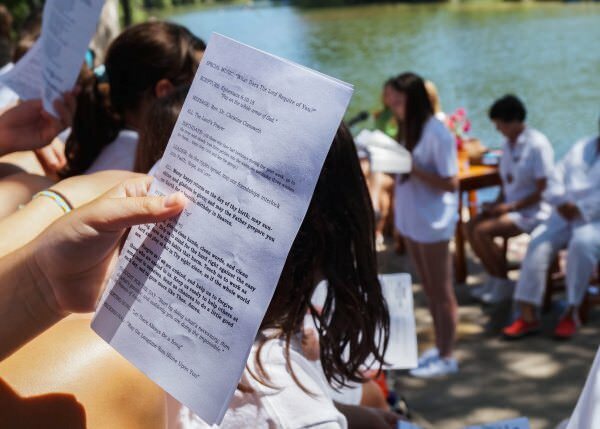 Every Sunday as campers gather beneath the cypress bows, we are reminded through the camp prayer that we must stand for the hard right against the easy wrong and ask that God teach us to work as hard and play as fair in God’s sight alone, as if the whole world saw. I remember that first Closing so clearly. All of the parents walked down the road toward the Big Tree and were greeted by their campers. When I saw our daughter sprinting our way with barrettes in her hair (a first) and an art project in hand, I couldn’t believe what I saw. What had her tepee counselor and the rest of the staff done to the daughter we dropped off a month ago? I never realized a six-year-old could undergo a character makeover, but I liked the results. As a parent, you want to provide the best for your children and give them as many tools as possible to survive, adapt, and thrive in today’s fast-paced world. So how can parents instill traits like independence, confidence, passion, and empathy in their kids? What we have discovered is by giving kids an opportunity to go to camp, then they will find their own path and experience character growth each day in the safe, supportive arms of camp. There’s no doubt that camp is an investment. However, any investment that shapes and enriches young girls’ lives in such a positive, fulfilling way is one to which we are fully committed. For in the end, the lasting value of giving camp to a child is priceless.